Según los arqueólogos las ruinas datan del periodo islámico temprano y de las cruzadas. Hallaron inscripciones en griego, monedas de bronce escritas en árabe y un templo circular que se cree se levantó como homenaje a un milagro. Las ruinas de una ciudad levantada en un terreno de 6 mil metros cuadrados y que estaba habitada por judíos y cristianos, fue hallada en Israel en la localidad de Mishmar David ubicada entre Jerusalén y Tel Aviv. Su descubrimiento se produjo durante una excavación ordenada para rescatar posibles ruinas antes de comenzar la construcción de modernos edificios de vivienda donde estuvo esa urbe. Los arqueólogos encontraron ruinas de casas residenciales y edificios públicos, de mansiones, calles y una zona industrial que albergaba también instalaciones agrícolas. Según los científicos las estructuras datan del período islámico temprano y el de las cruzadas. Entre esos restos, también hallaron un edificio de construcción circular con unos diez metros de diámetro -nunca visto en otras excavaciones efectuadas en Tierra Santa- y un piso decorado con mosaicos que muestran figuras geométricas y palmeras en colores. El arqueólogo Eli Yannai, director de la excavación, informó que el edificio circular puede tratarse de un homenaje, por un milagro ocurrido o un monumento por la visita de un santo al pueblo. Los investigadores que desenterraron las ruinas indicaron haber hallado dos "mikves", instalación sanitaria destinada al baño ritual y purificador, así como símbolos cristianos: cruces y lámparas de arcilla, e inscripciones en griego. Algunas inscripciones, redactadas en griego antiguo, mencionan a "la Madre de Dios", un dicho cristiano que se empleaba durante el período bizantino. Asimismo, fueron localizadas monedas de bronce en el yacimiento con leyendas en lengua árabe con la inscripción: "no hay otro Dios que Alá, y su siervo es Mahoma", relató Yannai. 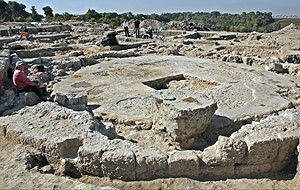 Evidence of an ancient settlement was uncovered in the IAA excavations that were conducted at Mishmar David at the request of the Israel Lands Administration. The construction and development at the site will be carried out taking into consideration the unique ancient remains and incorporating them into the new settlement. In the salvage excavations the Israel Antiquities Authority is carrying out at Mishmar David, at the request of the Israel Lands Administration, the remains of a large settlement that dates from the Early Islamic period to the Crusader period were exposed. Residential buildings, villas, public buildings, streets and alleys, and an industrial region in which there are agricultural installations etc were discovered at the site. The highlight of the excavations is a round structure built of well-dressed ashlar stones, c. 10 m in diameter and preserved to a height of 3 m. The floor of the structure is paved with a polychrome mosaic decorated with geometric patterns and a palm tree motif. Archaeologists from the Israel Antiquities Authority said this is a unique building, the kind of which has not been encountered to date in any other archaeological excavations in the country. The building indeed dates to the Byzantine-Islamic period but the nature of it and its purpose are unclear, it was reported. Dr. Eli Yannai, director of the excavation on behalf of the Israel Antiquities Authority, noted that buildings such as the one that was uncovered were usually meant to commemorate an important historic event that was of significance to the population that resided there. It can be a building that was erected in memory of a person who was martyred because of his religious beliefs, a miracle that occurred at the site or a visit by a saint, Yannai said. 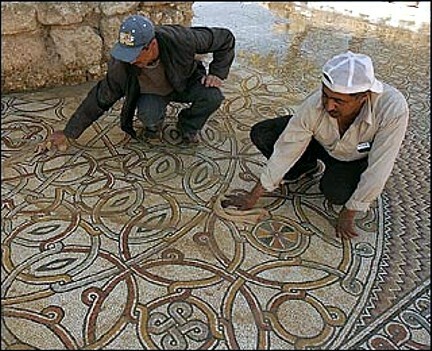 The importance of the excavation finds and their contribution to the study of the past lie in the intensity of the remains, the size of the Umayyad settlement which extends across c. 6 dunams and the evidence that the population that lived there was a Christian population prior to it having converted to Islam. The findings that support this assumption are unequivocal Christian symbols such as crosses that were revealed on clay lamps and inscriptions in ancient Greek that mention the mother of God  a Christian saying that was characteristic of the Byzantine period. In addition to this is the presence of an industrial zone for the large scale production of wine intended for consumption by the local residents and for commercial requirements. On the other hand the bronze coins that were recovered at the site bear the names of caliphs from the Early Islamic period and some of them were struck with the following Arabic inscription: There is no God but Allah and Muhammad is his servant. Area B (Hagit Torgë  area supervisor): building remains that date to the Umayyad, Abbasid and Mamluk periods were exposed, including the walls of a very large structure. Area C (Fanny Vito  area supervisor): in the northern part of the area remains of a round building were discovered including a mosaic pavement that dates to the Early Islamic period. The excavation around this building continues. The function of the building has not yet been established but given the thickness of its walls and its diameter (c. 10 m) this is a monumental structure that was probably a public building. In the middle area (Uzi Ad  area supervisor) remains of installations were discovered whose function is still unclear. In the southern part of the area (Gerald Finkielsztejn and Yossi Elisha  area supervisors) residential buildings and remains of another massive building, whose function remains unclear, were discovered. In Area F (Edwin van den Brink  area supervisor): tombs and the remains of a settlement from the Middle Bronze Age were exposed.